These pages will grow as long as the website continues. 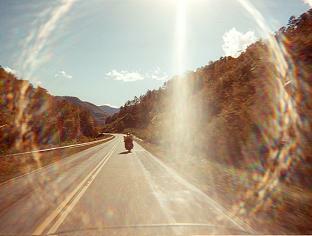 I take a lot of pictures while traveling on the bikes and so do many of my friends. This is just a random list of some of our favorites. I hope that you enjoy them as much as we did taking them! 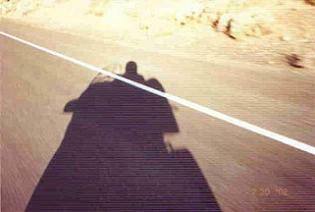 I was able to take a picture of my shadow as I was traveling out west to the Hotel. 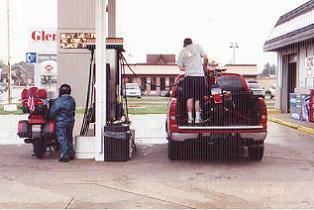 I guess there is more than one way to gas a motorcycle! That's Redbird and my lovely wife, Sharyn on the left. 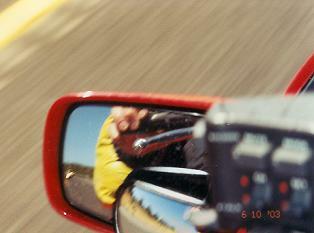 We were on our way to the Triple S 2003 in Canada. A new convert being baptized in the creek in the Smoky Mountains at a sweet church that I attended while heading back home. 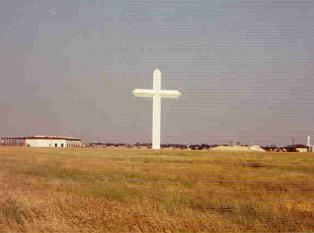 Reputed to be the largest Cross in the world. And where is it located? In Texas of course just off I40. Taken on a ride back from the Hotel. A floating bridge somewhere in New Hampshire(?). One of the organizers (Jay Richardson AKA Splash) of the Triple N rode his ST1100 across it and back. Andy of Mayberry police car replica in Mount Airy, NC. 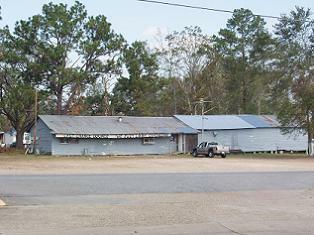 It is the town that Andy Griffith grew up in and got his ideas for Mayberry from. Taken on a West Virginia ride with some friends. The somewhat famous FoamHenge in Virginia near Natural Bridge. That's Moff (from Kent, England) looking at you who took me to get the next picture of the real deal! 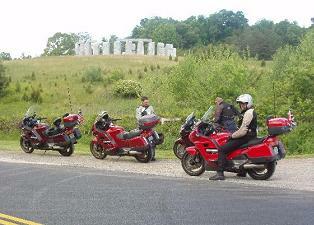 The famous REAL Stonehenge taken after BritSToc 2005 on our way back to London. Moff was leading us on this day also. 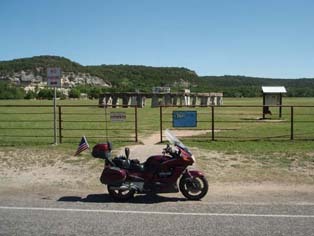 And here's another version located in the Hill Country of Texas. I'm probably the only human in the universe that has visited all three on the back of a Honda ST! 'Last Chance Lounge - We Just Look Expensive"
We were stopped in Tellico Plains, TN when a feller pulled up on this bike. It's some sort of Honda moped and it still ran like a top! Needless to say, this thing does not run. But it has my kind of favorite clothes on. 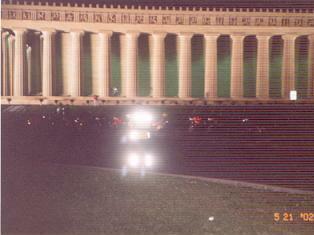 Taken during the Triple N tour. 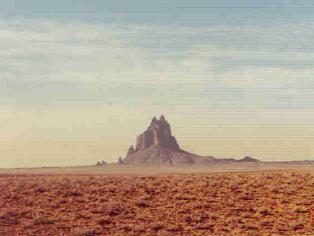 The magnificent natural monument Shiprock near the Four Corners area of Utah. I took this when I was visiting the canyons in the area. 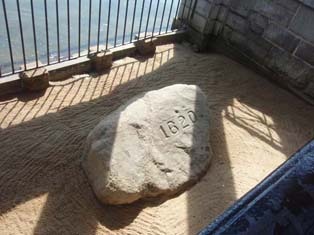 And another monument - one to government pork. 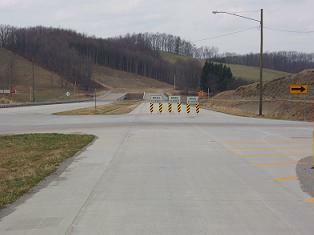 This nice West Virginia four lane just runs into the side of a hill in the middle of nowhere from nowhere. Taken on a West Virginia ride with friends. Look closely in the center of the picture and you will see a fighter jet that buzzed us on a Scottish mountain top during BritSToc 2006. One of our riding friends (Bamarider) used to wear a yellow helmet, so this seems appropriate to follow the previous picture. 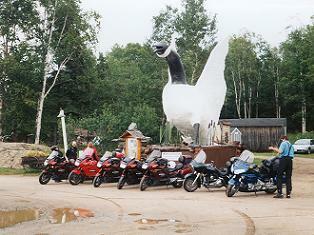 Taken in Canada during the Triple S tour. A rather unusual sign I encountered in Scotland during BritSToc 2006. 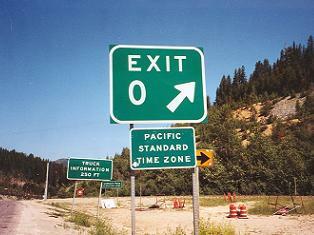 Maybe this was the exit they were heading for? Somewhere near California on one of my Hotel trips. 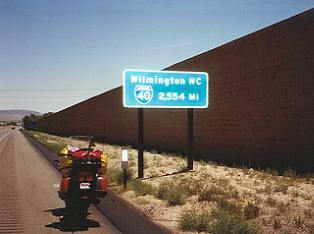 The western most point of Interstate 40 in California taken on one of my Hotel Trips A sign hard to miss in Wawa, Canada. 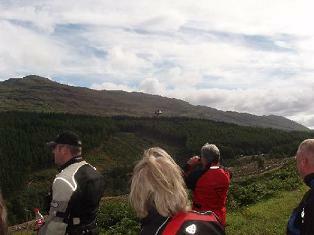 Taken during the Triple S rally. Just for grins I thought I would see if I could get a shot of me in the mirror during a ride to the Hotel. Close as I could get. Never figured out how this shot happened but I wish I could repeat it. Nice effect on a trip out west. I guess these two ravens at the Tower Of London were discussing the funny talking feller that took this picture! 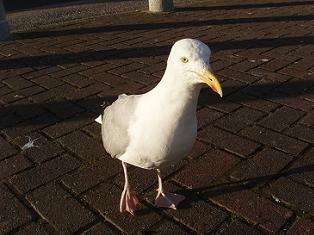 MacGull here told me - 'I will steal your fish and chips if I can'. At least that's what I understood him to say. Taken during BritSToc 2006 while I was enjoying some excellent fish and chips at a Scottish harbor.